Spotting a black squirrel for the first time can cause wonder, their shiny black coats so plain against the turf, compared with better-camouflaged gray squirrels. Although black and gray squirrels look different, they belong to the same species, the eastern gray squirrel (Sciurus carolinensis). Black coats are just one of the many possible eastern gray's coat colors. Fox squirrels, although usually reddish-brown, can also have black coats. Eastern gray squirrels' gray appearance is an optical illusion. Individual hairs are banded black, brown and white, giving an overall gray effect. Coat color changes seasonally; winter coats grow longer, thicker and silvery-gray before molting to yellowish-gray in summer. Coloration ranges among individuals from rare albino through light grey and brown to dark gray and brown to black. 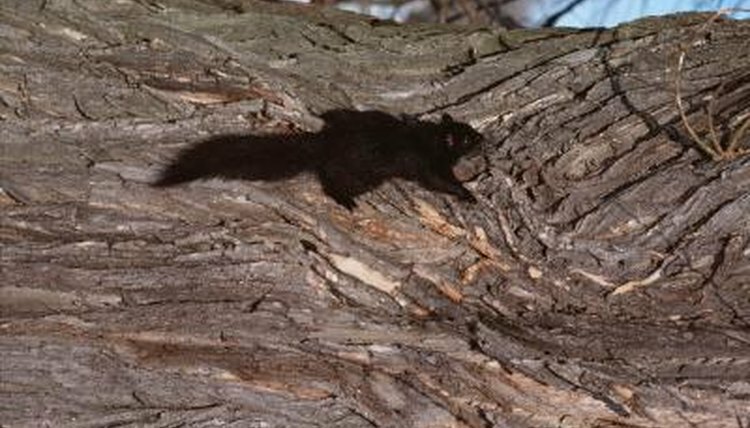 Coloration is hereditary, so squirrels of one color often exist in colonies; but spontaneous genetic mutations result in black specimens living among gray squirrels. Gray squirrels with black coloration are called black-phase gray squirrels. Colonies of black-phase gray squirrels exist throughout the gray's Eastern U.S. range. Their black coats make them more noticeable to the public, who feed them more, supporting colonies' survival. They are thought to be more prevalent in the northern United States. Stanley Park preserve in Westfield, Massachusetts, hosts a colony thought to be descended from a pair brought from Michigan in 1948. Black-phase squirrels are sometimes not completely black, their coats displaying gray or white sections or patches. Fox squirrels' Latin name, Sciurus niger, means black squirrel: The first one described in the 18th century was black. Usually a brownish, orange-red color, similar to a fox coat, fox squirrels can be black, white, gray or brown. Black fox squirrel colonies are prevalent on the eastern U.S. seaboard. Larger and more comfortable with foraging on the ground than eastern gray squirrels, fox squirrels out-compete their cousins for food where predators exist, but gray squirrels chase them out when both species aren't threatened by predation. Natural selection plays a large role in the success of black-phase squirrel colonies. According to a Penn State University website, black squirrels were more common in the past, when black was an effective camouflage against squirrels' main predators, hawks and owls. When seen from the sky, black coats fade into the shadows. Once people started hunting squirrels from the ground with guns, black coats became a disadvantage. Black stands out against light skies and is easier for hunters to see in woodland than gray. Black-phase squirrel populations declined, and gray squirrel numbers increased.